9.) Try not to dominate threads, particularly in a one-on-one argument. I’ve found that those are rarely informative, and the participants never reach agreement. A good guideline is that if your comments constitute over 10% of the comments on a thread, you’re posting too much. And if you’re a newbie, please read the posting rules. The one broken most often by new commenters is the requirement for civility. This entry was written by whyevolutionistrue and posted on February 1, 2019 at 7:15 am and filed under website matters, website-related items, WEIT. Bookmark the permalink. Follow any comments here with the RSS feed for this post. Both comments and trackbacks are currently closed. Seriously though, initially I thought your rules were too strict, but after a few month I changed my mind. Your website is about as agreeable as it gets, a balm compared to other sites with flame wars, insults and fake info, and I’m sure Da Roolz are instrumental in that. If I ever am going to start a website, ‘Da Roolz’ will be shamelessly plagiarised. I would comment but I’m afraid of breaking Da Roolz. With this comment, you are down to 20% – on equal footing with infinitimprobabilit. I think one of the Roolz should be “let common sense prevail”. Thanks for Da Roolz sir! 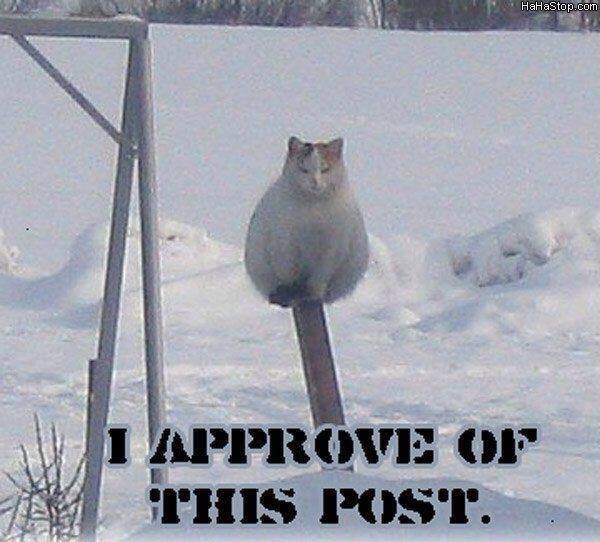 I am fascinated by the pole-sitting cat – photoshopped??? Oh, I just got the pun. ‘This post’. Duh, I’m slow today.